Watch Video: Look How AbRam Khan Got Chatty With Daddy Shah Rukh Khan! Shah Rukh Khan and son AbRam Khan had an adorable chat while leaving London Airport. Shah Rukh Khan is one the most doting fathers of Bollywood; his every appearance with his children further proves that. Despite his busy schedule Shah Rukh manages to remove time for his children Aryan, Suhana, and AbRam. Just days ago King Khan was in Goa for IFFI 2017 and yesterday he was at Farhan Akhtar’s Lalkaar concert. The concert was held to raise awareness regarding gender violence was attended by artists like Armaan Malik, Harshdeep Kaur, Papon, Salim-Sulaiman, and Sukriti-Prakriti. Recently, Shah Rukh Khan and his youngest son— AbRam Khan were seen leaving London’s Heathrow Airport’s Terminal 4. 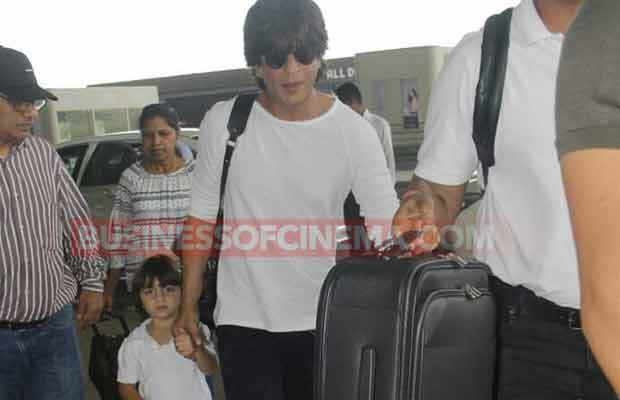 SRK and Abram were seen exiting the terminal complex hand in hand. Shah Rukh’s sister Shehnaz Lalarukh Khan too was accompanying the father-son duo. The little one, as usual, was twinning with his father. Shah Rukh and Abram, both were sporting black jackets and dark trousers combo. In the video, we can see that Shah Rukh’s entourage was following him and AbRam along with his sister Shehnaz. As they were walking toward their designated car we see little Abram trying to keep up with his father. The father-son even had a little chat where seemingly AbRam asked his father a question and Daddy Shah Rukh replied patiently. We also see fans surrounding the pair and asking for a picture. Take a look at the video and see why we are gushing over the adorable father-son duo. Recently, Shah Rukh Khan and AbRam were spotted at Aishwarya Rai Bachchan and Abhishek Bachchan’s daughter Aaradhya Bachchan’s 6th birthday party bash. In an adorable picture shared by Aaradhya’s grandfather Amitabh Bachchan, we can see Abram happily gazing at pink candy floss! Shah Rukh Khan too retweeted Sr.Bachchan and said that it was the moment that Abram will always cherish! Watch video: Shah Rukh Khan’s Son Abram Happily And Madly Dancing With Suhana Khan And Aryan Khan! Previous articleIshaan Khattar A Part Of Student Of The Year 2? Karan Johar Reveals! Next articleJacqueline Fernandez In A Punjabi Music Video?